Large Stakebed are built on medium truck chassis and are used to transport medium to large sized and medium weight cargo including pallets, drums, pipe, cylinders, totes, valves, heavy oilfield machinery, oversize gaskets, lumber and more. The Stakebed pictured above has a 38,000 lb GVWR which yields a cargo capacity of 18,000 lbs. These are trailers towed by pickup trucks. 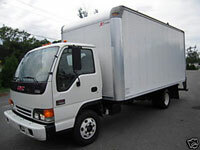 The trailer pictured has a 40 foot length and can carry 20,000 lbs. Goosenecks are most often used to carry large material where size of the material is more critical than weight. Some examples would include signs, skylights, large diameter pipe, drill pipe, and concrete castings. These are most often used to transport large sized and heavy weight cargo including large quantities of pallets, drums, steel coils, large crates, lumber and more. The length of the trailers is 48 feet and the capacity is 50,000 lbs. Flat beds can be loaded by lift trucks from either side, or they can drive onto the trailer from the loading dock. Flatbed trailers are also used to carry oversized freight which requires permits.